This post is part of a new series I'll be running that I'm calling "Olde York Times Science". I've scoured the archives of the New York Times and found some very interesting historical neuroscientific tidbits that I have to share. It's fascinating to see how far neuroscience has come in some respects and how stagnant it is in others. The first article I've picked is from 1927, titled "The Human Brain Still Puzzles Scientists". Here we are, 85 years later, and I'd say little has changed! See? Could you do better than this? The article takes a general look at the equality of the sexes. In it, James Papez (yes, the same guy we use in our arguments about zombie brains), examines the brain of "noted feminist" Helen Gardener and concludes that "the brain of a woman need not be inferior to that of a man of equal rank". The article is broken into eight sections, the first of which focuses on the effect of brain size/weight on intelligence. The article outlines the (relatively) new idea that it's not the total size of the brain that determines intelligence, but rather how developed different regions of the brain are with respect to one another. It notes that we still refer to intelligent people as "mental giants". 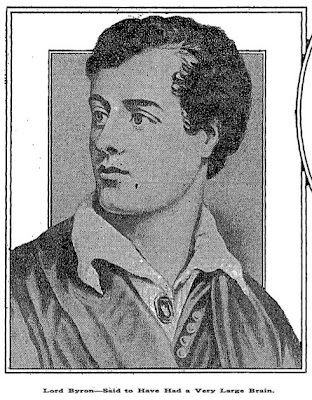 Amusingly, there's a huge section at the top that notes that the poet, Lord Byron, "is credited with an enormous brain". The second section is titled "The Brain and Destiny". There's a remarkably astute quote in there that encapsulates emergence in relation to human behavior and argues for a cognitive neuroscience approach to studying the brain: "From odor alone one could not deduce the structure or chemical properties of a rose... So with the brain. We cannot arrive at its structural significance through the study of psychic processes alone." 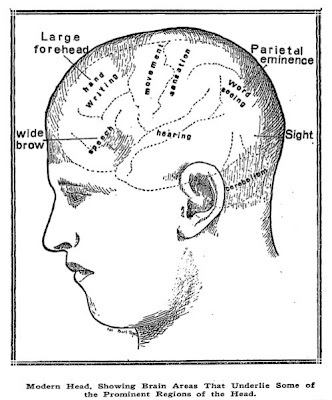 The article notes that the neocortex is the seat of conscious processes, citing work by Broca and dismissing phrenology, and shows how comparative neuroanatomy has found that the human brain is more convoluted, less homogeneous, and therefore, likely more specialized, than animal brains. It discusses how the functional segmentation and differentiation of the brain into motor, somatosensory, sight, and hearing regions permits one to "be hearing, seeing, thinking, talking and even writing at the same time." Later, Papez notes that "the important relation of environmental factors to mental development is common knowledge to every educator." He goes on to say that the modern world "create[s] a new environment... which greatly enriches and quickens... mental experiences," and that "education and achievement is correlated with good all-around brain development." In his examinations of Gardener's brain, Papez says that, while smaller overall, her brain is no different from that of the "best brains in the Cornell collection" and that the "entire language zone of her brain shows a superior development". Apparently, Gardener made quite a splash when she gave a speech at a suffrage convention arguing against the idea that women are clearly inferior to men because of their smaller brains. In her speech, she opened with saying that "the last stronghold of the enemy is scientific," and proceeded to "blow up the enemy": "If absolute brain and not relative weight is the test... [then] almost any elephant is several Cuviers in disguise, or perhaps an entire medical faculty." "On that speech she rested her case. Her own brain has now added its testimony." I'm quite impressed at the modern, sophisticated view of the brain and behavior. I believe that many people tend to think of anything before neuroimaging as the neuroscientific dark ages. This article is a great counter to that idea. You can open the pages of any modern media report of neuroscience breakthroughs and see these same ideas hailed as great new advances. When I was a first-year graduate student I had lunch with Daniel Dennett (namedrop) during which he quipped that a new student could make a whole career by looking at papers from the 1960s and 70s and just running the experiments again using modern techniques. While your conclusions would likely be the same as those older studies, you'd have a massive supply of research ideas. I'm really starting to think he was right. In closing: don't forget... everything old is new again.